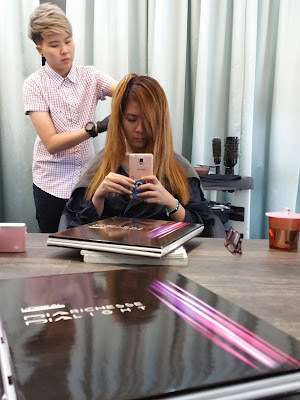 Previously, I mentioned about my first experience with the latest Mucota Omega Oil Therapy at Focus Hairdressing and about 3 weeks after getting back frizz-free, shiny and smooth hair, I returned to Focus Hairdressing to get rid of my Golden Lion Tamarin hair. Due to previous hair damage from bleaching, Ken highly recommended that I do a glossing with a semi-permanent hair colour as they're less damaging to the hair as compared to the usual permanent hair colour. So, Loreal DiaLight it was! Knowing that I wish to get rid of the yellowish-gold tones of my faded colour, Ken ran through his recommended colour (eg. how ash tones will help neutralise out my yellowness) and shade numbers with me before I finally decided on the colour I wanted. They were pretty packed that day and I was tended to by Sito, and then a few other stylists who were free to check on me while Ken got busy with other customers. Even Marcus, the founder of Focus Hairdressing, was in for a haircut when I got there. Just like Ken, Sito isn't your overly friendly, unusually chatty kind of hair stylist, which went just right with me. The whole session of having the hair colouring cream applied onto my hair was just comfortably silent, so for those who prefer hair stylists who doesn't try too hard to strike up conversations, Sito is the stylist you'll want to look for. The hair colouring procedure was just like the usual and in about an hour and a half of work, I got rid of my golden yellowish hair and welcomed back my chocolate brownish hair. And of course, I moved on to my hair treatment for the day, the Mucota Scena hair treatment, which was highly recommended by Ken to further save my well recovering bleach-damaged hair, with its effect lasting up to 1 month. Well, just to show you that they're really made in Japan. I apologise for the really bad picture of the products, I gave up on trying to arrange them nicely on the obstructing cloth. By right, I should have my hair going into the steamer after both step 1 and 2, but in order to protect my new hair colour, hair steaming was skipped for step 1. Say hello to my brown, soft, smooth and shiny tresses! I know, the 'balayage' effect from the bleaching is still there, but at least I don't get a random tuff of barbie-blonde hair on the left side of my head. It's really important that we do a hair treatment after a hair colouring, not just to keep our hair soft and shiny, but also because the effects of the hair treatment done right after hair colouring is the greatest (apparently, the hair absorbs the nutrients better and more easily as our hair cuticles are all 'opened' from the chemical procedure). And it's just so nice that Focus Hairdressing gives a 20% discount on Mucota Scena Hair Treatment as long as you couple it with a hair colouring service for now, so instead of the usual $120 (flat rate, unless you have abnormally thick and long mane), it will only be $96! thanks for the recommendation. I badly need to retouch my hair color! Mucota Scena Hair Treatment is a really interesting treatment, but it's not available in my country. Beautiful shade... it does suit you splendidly. Seems like an interesting treatment, may choose it if its available at the L'Oreal India salons. Great final look. You can really tell the difference your hairs were treated. Your hair looks gorgeous dear! Such a difference one treatment can make! nice natural colour....great for any look and easy to pair with outfit too! Seems like the colour suits you best. Looking great Mia. Seems to make your hair shine, this treatment - looking good babe! It suits you best girly.